Puri or Masala puri or Farsi puri is a favourite tea time snack at home. It can be stored for longer period of time which gives it a preference over other snacks. This is also one of the food snack which is prepared by me and mom for this diwali (posted earlier recipe of Shakarpara and Ghughra). Take a large plate, put both the flour in it. Add all other ingredients to it and mix them well. Knead the dough by adding water little by little till you get soft and pliable dough. Make big sized balls out of it. Roll it into a big chapatti using rolling pin keeping it little thick. With the help of a cup cut/make rounds on the sheet. 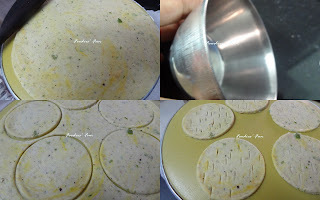 Take out the puri and make cuts on the puri with the help of blunt knife so that your puri does not swell up. Heat the oil in kadai to fry puri. Fry on medium flame them until both the sides turn golden brown and crispy. Place puris on absorbent paper to remove excess oil and let it cool. Then store it in an air tight container and eat whenever you want to.